Four survivors from last year’s All-Ireland winning team named in the Banner County line-up. Shane O'Donnell is in the Clare U21 team to face Waterford. SHANE O’DONNELL spearheads the Clare challenge for tomorrow evening’s Bord Gáis Energy Munster U21 hurling semi-final against favourites Waterford. But the 2013 All-Ireland senior final replay hat-trick hero is one of just two senior squad members named in the Banner County’s starting line-up. In contrast to recent years, when there was a massive crossover between the senior and U21 squads, Clare are relying on a new crop of emerging young players as they go in search of a fourth successive provincial crown at this grade. O’Donnell is named in the full-forward line for the visit of the star-studded Déise to Cusack Park in Ennis. Of the 26-man senior panel for last Saturday’s All-Ireland qualifier loss to Cork, just O’Donnell and Bobby Duggan are included in the U21 starting 15. O’Donnell scored two points against the Rebels but Duggan was an unused sub. The Clare line-up includes four of the team that started last year’s All-Ireland U21 final win – Keith Hogan, Conor Cleary, Duggan and O’Donnell. Tomorrow evening’s clash is live on TG4 and will have a 7.30pm start. Email “Just 2 senior hurling panellists on Clare U21 team for Munster semi-final”. 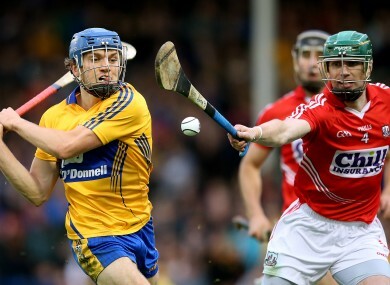 Feedback on “Just 2 senior hurling panellists on Clare U21 team for Munster semi-final”.